It was Amitabh Bachchan’s 70th Birthday Celebration Party. 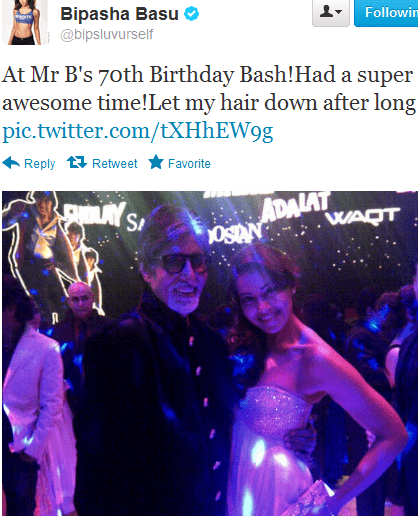 As it was Birthday of Big’B; Many Btown Celebrities spotted there. Among all celebrities, some of them were best dressed and some of them were same in old look. We find out Bipasha Basu was best dressed at Amitabh Bachchan’s 70th Birthday Bash. She went for princess themed for the evening. What Bipasha Basu Wore on Amitabh Bachchan Birthday Party? She wore fantasy white gown with flouncy curls. She opted restrained make-up and hair, paired with a stellar Halston Heritage dress. She also tweeted her picture with B’day Boy Amitabh Bachchan that day; saying “Let My Hair Down After Long Time” n We noticed and Loved that too.